Because it was built when horses and feet were the prime means of transport, Boston can be confusing to travel in. Here are tips to speed you on your way. Most short-term visitors to Boston find that walking and the subway are the most convenient ways to get around, though biking is a better choice in some cases, and Boston has its own Hubway short-trip almost-free bike rental system. City buses and Commuter Rail trains are helpful to some destinations, driving a car makes sense to others. After you arrive at Boston-Logan International Airport, here's how to get into the city from the airport. The subway station beneath South Station serves Red Line trains via Park Street Station (change for the Green Line) to Harvard Square and Cambridge; and Silver Line buses to the Seaport District, Boston Convention & Exhibition Center, and Logan Airport. MBTA Commuter Rail trains to points on the Massachusetts North Shore, and the Amtrak Downeaster train to Portland ME, depart from North Station. 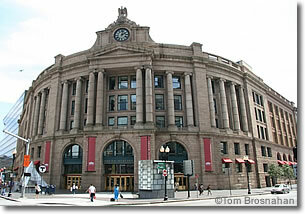 Boston's South Station Transportation Center, hub for Commuter Rail trains, intercity trains and buses.